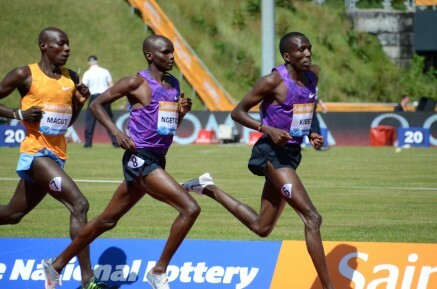 8th September 2015 – Vincent Kibet’s victory at the IAAF World Challenge meeting in Zagreb highlighted a busy few days for PACE athletes in the wake of the IAAF World Championships. Having now fully recovered from an illness that he had earlier in the season, Vincent was able to sprint away from an international field in the final 100m of the mens 1500m and take the win in 3:38.55. Not the fastest time but a good confidence boost after a stop-start season. There was a personal best for Selah Busienei (KEN) in the womens 3000m as she took third in 8:54.15. At the IAAF World Challenge meeting in Berlin on Sunday, Shannon Rowbury (USA) and Magdalyne Masai (KEN) also ran personal bests. Shannon stepped down to the 800m and clocked new figures of 2:00.03 for fifth place. Magdalyne participated in the rarely run 2000m steeplechase and ran 6:10.82 for fourth. This followed Shannon’s run at the IAAF Diamond League meeting in Zurich where in the 3000m on this occasion she finished in seventh place, one second and one place behind World 10,000m Champion Vivian Cheruiyot (KEN). Tom Lancashire (GBR) is also showing good end of season form and he ran a personal best of 7:49.35 for second place in the 3000m in Gothenburg.